LeChase has been working on electrical and mechanical infrastructure upgrades at the seminary as well as the boiler plant that provides steam heat and hot water to the campus. Part of the project includes adding a backup generator and a new chiller to bring air conditioning to several areas of the main building. 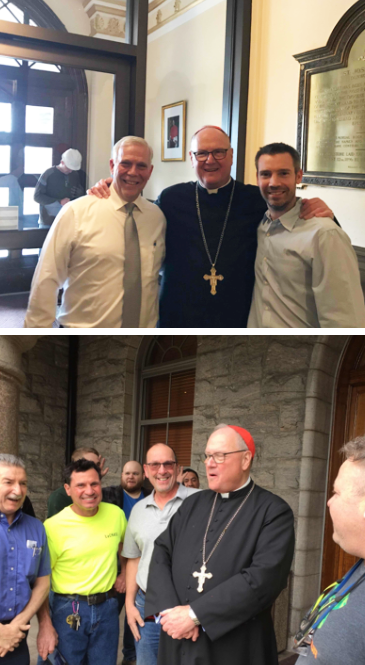 Top photo: Cardinal Dolan with Project Executive Stephen Strebel (left) and Project Manager Chris Strebel (right); bottom photo: Superintendent Kevin Chmielnik (gray shirt with glasses) and other project team members meet the Cardinal.